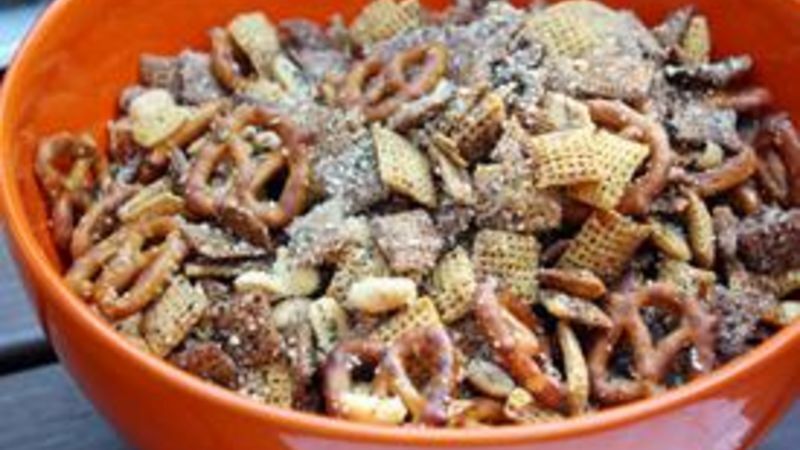 In a large bowl, toss together Chex™ cereal, pretzels and mixed nuts and set aside. In a small saucepan over medium heat, melt butter. Stir in oil, balsamic vinegar, Worcestershire sauce, Italian seasoning, paprika, garlic powder and onion powder. Remove from heat and pour over mix; toss to combine. Pour mixture onto a rimmed baking sheet and bake 1 hour to 1 hour, 15 minutes, stirring every 15 minutes, until toasted. Remove mixture from oven and let cool 5 minutes. Top with basil, thyme, tarragon, rosemary and Parmesan cheese. Toss to combine. Allow mixture to cool completely before serving. And this Summer Herb Chex Mix is the perfect accompaniment to #6 (and #4, too. And really, any time in the summer). Why? Because it’s made with summery herbs and other goodies, and it makes any occasion a party. That’s why we call it a party mix, yo. So let’s do this thang! First, toss together several cups of corn, rice and/or wheat Chex cereal with a couple cups of mini pretzels and mixed nuts. It’s gettin’ good already! Next, melt some buttah with olive oil, balsamic vinegar, Worcestershire (bonus points if you can say that one three times fast) and Italian seasoning and pour that deliciousness all over the dry mix. Now toss that mix like it’s 1999. Or, you know, 2012. Put the mix in the oven and bake it until it’s all nice and toasty, then take it out of the oven and add the herbs. I used dried herbs because that’s what I had on hand, but fresh herbs work just as well (you’ll just need to use a bit more, no bigs). Now add the grated Parmesan. OH YES. And mix it all together until everyone is best friends. Now, share the party mix with your best friends and watch the party unfold. But beware: This mix is known to cause a really, really good time.